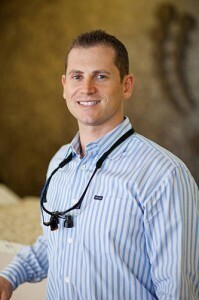 Dr. Jonathan Kalika double majored in Physiology and Russian at UC Davis prior to attending Tufts Dental School in Boston. After graduating with his DMD from Tufts in 2004, Dr. Kalika joined the Dental Center of Mesa and has been providing exceptional dental care ever since. He is a member of the American Dental Association and has taken advanced courses in many areas of dentistry, including IV sedation for Duquesne University in Pittsburgh, PA.
Dr. Kalika’s goal as a dentist is to help anyone and everyone in need. He caters to all types of patients, both young and old and welcomes new patients to our office to experience the high-quality care that they deserve. When not at work, Dr. Kalika, the father of three children, is big into sports and his family. Those who know him best say that he is an adrenaline junkie. He loves all types of sports and plays soccer in an adult league. Dr. Kalika also enjoys dirt biking, working out, wakeboarding, and watersports.